I wish all the readers and visitors of Padhuskitchen "A Very Happy New Year". Hope you all had a great time celebrating it with family and friends. Today we will learn how to make Custard powder biscuits following this easy recipe. 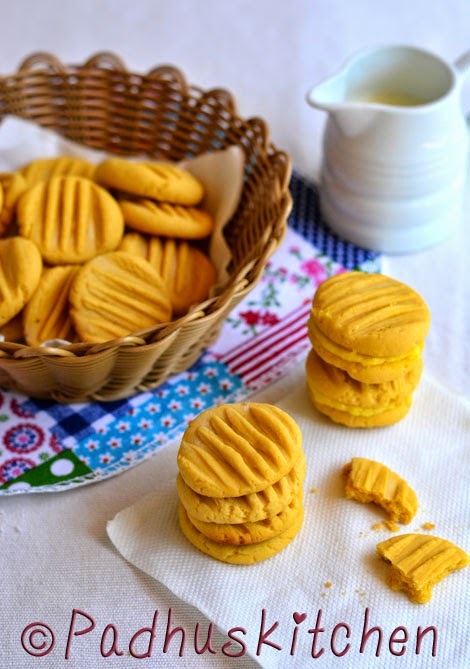 Custard powder biscuits or cookies are made with custard powder. They are called "Yo Yo Biscuits" because they resemble the "yo yo toy". They are traditionally sandwiched together with butter cream filling giving them their ‘yo yo’ shape. These cookies are easy to make and are deliciously soft, crumbly and melts in your mouth. You can have this as a tea time snack. Kids will love these biscuits very much for sure. Sieve together custard powder and flour. In a bowl beat together butter, powdered sugar and vanilla extract until light and fluffy. Add the custard powder + flour mix to the butter mixture and beat on low speed until the mixture forms a soft dough. Refrigerate the dough for 30-45 minutes or until it is firm and can be shaped easily. Divide the dough into 24-30 equal parts. Roll it into smooth balls and place them on the baking tray 3 cm apart. Dip the tines of the fork in flour and press down each ball slightly to create striped patterns as shown in the picture below. The thickness of the flattened dough should be approximately around 1 cm. Place it again in the refrigerator for 15 minutes. In the meantime, preheat the oven at 180 degree C for 15 minutes. Bake the biscuits at 180 degree C in the middle rack for 15 minutes or until the bottoms start to turn golden. If you over bake the biscuits, they will loose their melt in the mouth texture. Remove from the oven and let it sit for 3 minutes. Then transfer the biscuits to a wire rack to cool completely. The cookies will be soft when taken out from the oven. It will become firm once cooled completely. Beat all the ingredients mentioned under "buttercream filling" until smooth and creamy. Sandwich the biscuits together with butter cream. Sandwich only when required as they get soggy if left joined up. The biscuits taste delicious plain also. I personally liked it plain without the buttercream filling. Storage and Shelf life - Store it in an air tight container in the refrigerator. It will keep well for 4-5 days. here butter is normal one or unsalted at room temp. Unsalted butter at room temperature. You can bake in in Microwave Convection mode but not sure of the settings as I use only my otg for baking.